In this spooky and exciting quest, you must explore a haunted house, looking for treasures that supernatural creatures are after! One of the most exciting ones... this whole walkthrough is written as a creepy Halloween story. Sorry if you have trouble following along! This card used to be free. Before that is was actually an island that could be unlocked for 350 credits. Then it was 75 credits, then now it's free again. Get it while the Creators are still making up their mind! And this is how you do it. No, you aren't a pirate. You emerge from the ground in a spray of dirt. There are creepy gravestones everywhere, and most importantly, a bat with a key flying around. You chase it up to the roof and nab the key from its claws by jumping to it. Then, on the left side of the house, you find a bulkhead leading into the cellar. Fighting your common sense, you go in. Yes, you have no need for kerosene. Yet. 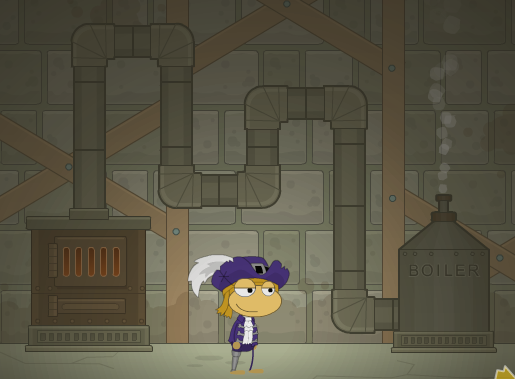 Continue on and you find something very strange -- the pipes from the boiler to the furnace are disconnected and floating in midair! After you have fixed the pipes by rotating them to connect the furnace to the boiler, the boiler starts spraying steam. Using the current as lift, you reach the shelf above and find the draught, your first treasure. Unsure as you are about carrying such a curious substance, you take it anyway. Shivering in fear, you take the staircase to the right up to the mansion. It's not as creepy as you'd expect -- yet. The ghost cat in the foyer to the right tells you to bring the four treasures to her after you have found them. For now you take this clue to the refrigerator at the left. You cannot chisel out the ice with your bare hands, who do you think you are?! Passing the fridge and the creepy exercising plant, you climb up the rickety wooden steps to the second floor. Hey, are those paintings' eyes following you? Desperately quelling insanity, you continue right until you see two knights in metal armor that are blocking your path. In a rage, you jump on top of the knight on the right and he drops the pickax. Suddenly you have a moment of inspiration. You run back down the stairs and hack out some ice using the ax. Proudly, you lift out your second treasure. Before you get too attached you take it up the stairs to the knights, apologizing profusely for your outburst. You climb up to the next floor and enter the bedroom to the left. Perhaps you thought you saw a ghost in a bathtub; at that point, you closed your eyes and counted. However, you broke down in hysterics before reaching ten. Anyway, now that you are well, you go left in the bedroom and pick up the phone. After you have answered the freaky call from the grave, you find two clocks on the mantel. So that's what "when midnight strikes twice" means. When one of them strikes midnight, a skeleton will pop up on top. Soon you find moving your mouse on a clock speeds it up temporarily. Since it has to strike midnight twice, the clocks need to be synchronized in this way. Not long after, you figure out that if you speed up a clock that's a tad behind just as the other one is about to strike midnight, and if both skulls pop up at the same time, you will soon find the lantern in the fireplace. Excited that there is only one more treasure to go, you dash into the last room in the hall, the dining room, to the right. column C up, column B down, column A up. row 3 left, row 2 right, row 1 left. Inside, you find the chalice, your fourth and final treasure. You decide to take them all to the ghost cat in the foyer, first floor. The broom following you diligently does not faze you in the least... or so you keep repeating to yourself in your head, louder and louder, until you hear nothing but the futile affirmation and the pounding of blood in your ears. Once again you take a break to cool down. You shouldn't talk to the cat in this state! What? The lantern needs to be lit! How are you gonna... oh! Now you remember the kerosene in the basement, and run back down to it. All the way to the left, you find the kerosene. Now the gloomy, red glow fills the room. Slightly miffed at this inconvenience, you return to the cat. Remarkably, you decide to obey the cat's request and leave the mansion, then locate ol' Betsy Blue's grave. Perhaps more remarkably, the grave is open. Shivering with fright and now firmly believing yourself insane, you enter it. And what do you find? A WITCH! And... huh? Punch? "Ghoul's Gala?" The chalice, ice, and drought is being used for a PARTY?! So why did you have to run around like that being scared all night? Because there's 50 credits on the other line. And this place is a Costumization mine! Don't drink the punch, though. Leave the place after you've had enough of the cheesy jokes, which, by my calculations, will be just about now.